This has been floating around the Internet for years so it’s nothing new but for anyone that puts a premium on battery life on their Surface Pro (original or Pro 2) like I do (I specifically need to extend the battery because 90% of what I do with it is take handwritten notes using the stylus & OneNote) then this might interest you. In order to extend the battery life a bit, all you have to do is change the the maximum processing power percentage assigned to the Power Options profile on your device from 100% to 80%. This provides a noticeable difference in battery life – some have reported up to 1-2 hours, & for most purposes like inking in OneNote or browsing, you’ll probably won’t see any change in performance. Right click on the battery icon in the System Tray & select “Power Options”. Select a Power plan by clicking on a circular radio button in the list of plans. 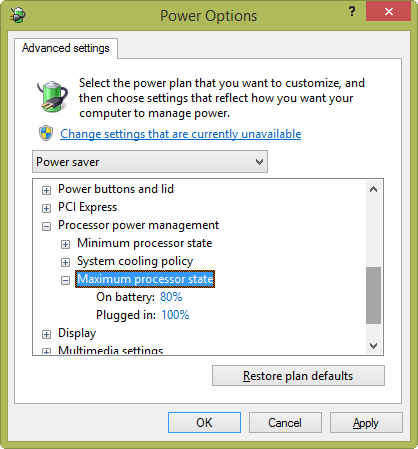 You may select any Power Plan however I select “Power saver”. Expand the selection for “Processor power manager but clicking the “+” next to it. It should reveal “Maximum processor state” as on of the list items. Expand the selection for “Maximum processor state” and select “On battery”. This should allow you to change the percentage of processor time used by the device. Change the “On battery” setting to “80%”. Click the “Ok” button which will close the dialog. You may need to then click “Save Changes” in the following window. I’m going to run some tests on how this affects the Surface Pro & Surface Pro 2 but the results have been promising so far. I suspect that with this setting, I may be able to get as much as 9 hours on my Surface Pro 2.